This comfortable suede bracelet features a symbolic St James cross with an additional little hanging cross charm. It makes the perfect gift to support your friends or loved-ones as they travel through life and face its challenges. The 1,000-year-old pilgrimage to the shrine of St. James in the Cathedral of Santiago de Compostela is known as the Way of St. James (El Camino de Santiago - in Spanish). Some 200,000 pilgrims travel to the city each year from all over the world to find inspiration and/or deeper spiritual understanding. Many carry with them a St James's Cross - believed to promote strength and hope. 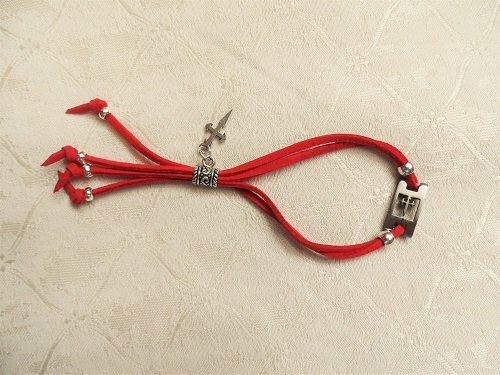 Dimensions: The bracelet is adjustable to approx 24cms (9.5"), so is suitable for most wrist sizes. Soft suede bracelet with metal beads and crosses. Available in black or red - Please choose in Options box. The 1,000-year-old Way of St. James (El Camino de Santiago - in Spanish), criss-crosses Western Europe, arriving at Santiago de Compostela in Northern Spain on the Atlantic coast. Some people walk, others travel by bike. Many travellers choose to do the Camino for personal, rather than any spiritual or religious reasons - taking time out from their busy, modern lives and perhaps finding inspiration along the way, whilst reflecting on their lives in a supportive environment. Many carry with them a St James Cross. Everyone experiences the journey in a different way. Show them that you care and that you are thinking of them with this symbolic Camino bracelet. Comes gift-wrapped, like all our presents - and we can print a personal message on your behalf.